Editor's Note: Officials said today that the start of the trial of Chris Simcox had been delayed until Monday, March 23. One of the great ironies of the now-moribund vigilante border-watch movement is that its members were obsessed with the lawlessness of the immigrant border crossers they sought to apprehend — but themselves often had criminal backgrounds or, worse yet, hid behind their activism to pursue criminal acts. Simcox was the co-founder of the Minuteman Project, the April 2005 gathering on the Arizona border of citizen border watchers south of the Tombstone area, where Simcox lived at the time. Originally founded as a border militia, Simcox and his Minutemen became the epitome of the nativist border-watch movement, embodied by a national fund-raising campaign that he led to build a fence on a section of the border as a demonstration project that mostly ended up lining the pockets of his Beltway-based handlers. The movement, which peaked with 319 nativist extremist groups in 2010, had faded to just 19 groups by late last year. Simcox was a volatile personality with a history of destroyed relationships, and eventually his Minuteman Civil Defense Corps (MCDC) shut down amid turmoil within its ranks over finances and egos, as well as the decline of its reputation as the border-watch movement became increasingly associated with criminality. Simcox himself provided the latest evidence of that association when he was arrested in July 2013 and charged with three counts of child molestation — later reduced to two — after his then-6-year-old daughter and one of her friends, age 5, accused him of sexually assaulting them. If convicted of the felony charges, Simcox could face life in prison. 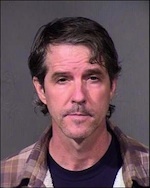 Simcox goes on trial this week in Maricopa County Superior Court in Phoenix on the charges. 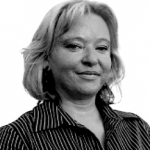 (Hatewatch will provide coverage of the trial.) He plans to act as his own attorney in the trial, although he will be required to work through his court-appointed associate attorneys when it comes to cross-examining his two alleged victims. Simcox’s is hardly the only such case. Seen retrospectively, the border-watch movement was remarkable for the number of its leaders and participants whose careers ended in criminal acts. Even before Simcox came along with his Minuteman concept, one of the early border-militia organizers who preceded him also had a number of brushes with the law. Casey Nethercott, another Arizona resident, was involved in a border-watch operation called Ranch Rescue at the turn of the century, and he too had a number of criminal legal problems. Nethercott — who had done prison time in California for assault in the 1990s — and some of his fellow Ranch Rescue members in 2003 assaulted two Salvadoran migrants who had crossed the border on foot and wound up on a ranch where the nativist border watchers operated. The migrants were held at gunpoint, and one of them was pistol-whipped and attacked by a Rottweiler. With the assistance of the SPLC, the migrants sued their attackers and won a million-dollar civil judgment against Ranch Rescue, including $500,000 against Nethercott, who also faced criminal assault charges in the case but eventually had them dismissed. 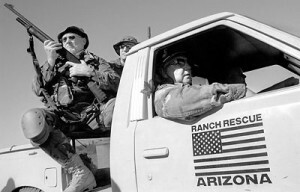 Nethercott eventually left Ranch Rescue and then began organizing his own border watches at a property he purchased in Arizona. Eventually he had a tense standoff with Border Patrol agents at that property; when FBI agents tried to arrest him for his role in that incident two weeks later, they wound up shooting the white supremacist who was accompanying him at the time. Indeed, while the phrase “rule of law” even today is often bandied about by the remaining bands of vigilante nativists, the record demonstrates that this was a peculiarly flexible concept for many of the Minutemen and their associates. Shawna Forde, for example, incorporated the phrase into the logo for her offshoot border-watch operation, Minuteman American Defense. Forde’s operation was widely promoted at the website of Simcox’s Minuteman Project co-founder, Jim Gilchrist; previously, she had been deeply involved in Simcox’s MCDC operations in Washington state. 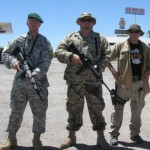 Then, in June 2009, Forde was arrested and charged with masterminding the horrific murders of a 9-year-old girl and her father in the small Arizona border town of Arivaca, along with a white-supremacist cohort named Jason Eugene Bush and a local man, Albert Gaxiola, as part of her plan to create a border-militia compound. All three were convicted, and Forde and Bush wound up on Arizona’s Death Row. After the arrests of Forde, Bush and Gaxiola, Forde’s former associates in the Minuteman movement fled from their onetime protégé. National leaders of the Minuteman movement — particularly Simcox and Gilchrist — hastily tried to put distance between themselves and Forde and her group. To this day, Gilchrist tries to claim that he had little to do with her. 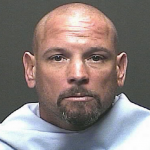 In April 2012, one of Forde’s associates in the desert, a Tucson man named Todd Hezlitt, was arrested and charged with two counts of sexual conduct with a minor for an affair he had initiated with a 15-year-old girl from a local high school where he was an assistant wrestling coach. Two months later, he fled with the girl to Mexico, and he briefly became an international fugitive. A few weeks after that, the girl turned herself in to the American consulate in Mazatlan. Hezlitt was caught a short time later and extradited. He eventually wound up agreeing to plead guilty to the sexual conduct charges in exchange for not being charged with kidnapping, and was sentenced to six years in prison. Another violent incident from a former border watcher erupted in Arizona in May 2012 when Jason Todd “J.T.” Ready — a longtime leader of the state’s neo-Nazi National Socialist Movement, and an organizer of independent NSM border watches in Arizona — went on a shooting rampage at the home of his girlfriend. Before committing suicide, Ready shot and killed his girlfriend, Lisa Lynn Mederos, 47; her daughter, Amber Nieve Mederos, 23; the daughter’s boyfriend, Jim Franklin Hiott, and Amber’s 15-month-old baby girl, Lilly Lynn Mederos. Investigators later found chemicals and military-grade munitions that apparently belonged to Ready at the residence.